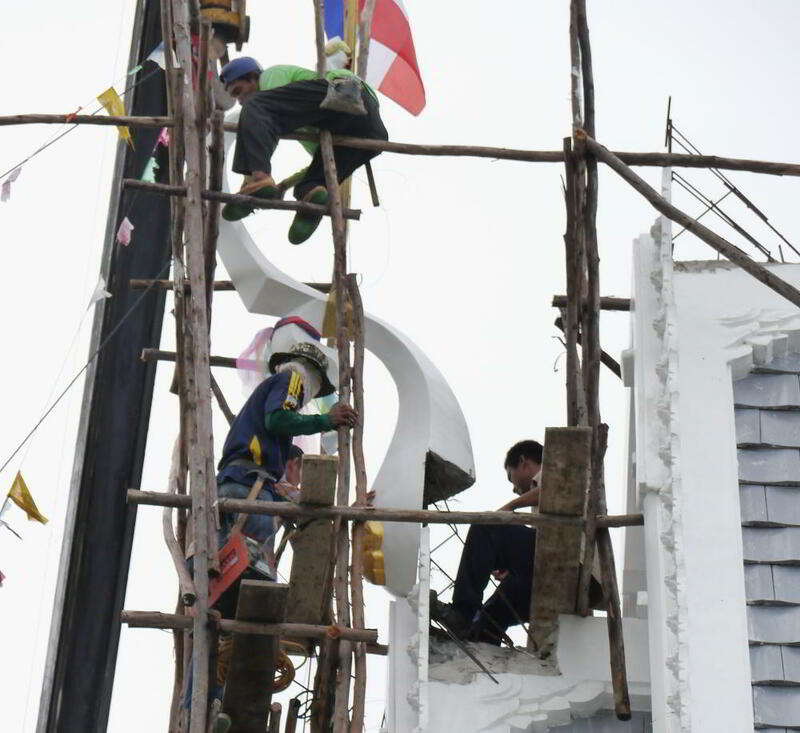 So far as I know the “Yohk Chofah” (Raising the Chofah) ceremony must be performed during the construction of every Buddhist temple in Thailand. Yohk Chofah ceremony is performed when the Chofah is raised to the temple roof and secured to the gable of the roof. What is a Chofah ?, If you have ever seen a Buddhist temple you will without doubt have seen a Chofah. The Chofah is the long pointy piece attached to the gable of the temple roof. There are different theories of what exactly the Chofah represents but the most popular belief is that the Chofah is a representation of Garuda, another popular theory is that the Chofah is a representation of the Naga. Chofah translates simply as “bunch of air” or “tassel of air”. The Chofah is slowly and ceremoniously raised to the temple roof. 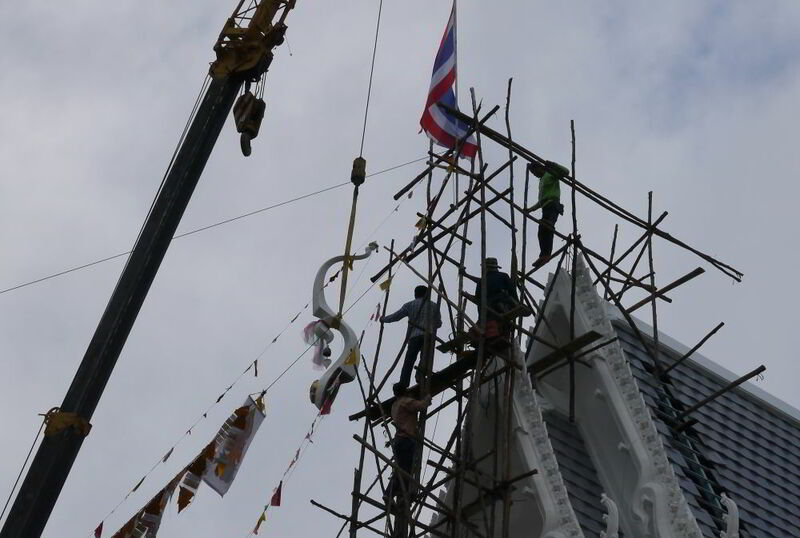 Accompanied by much ceremony, the Chofah is hoisted to the roof by crane, and finally fastened in position on the gable of the temple roof. 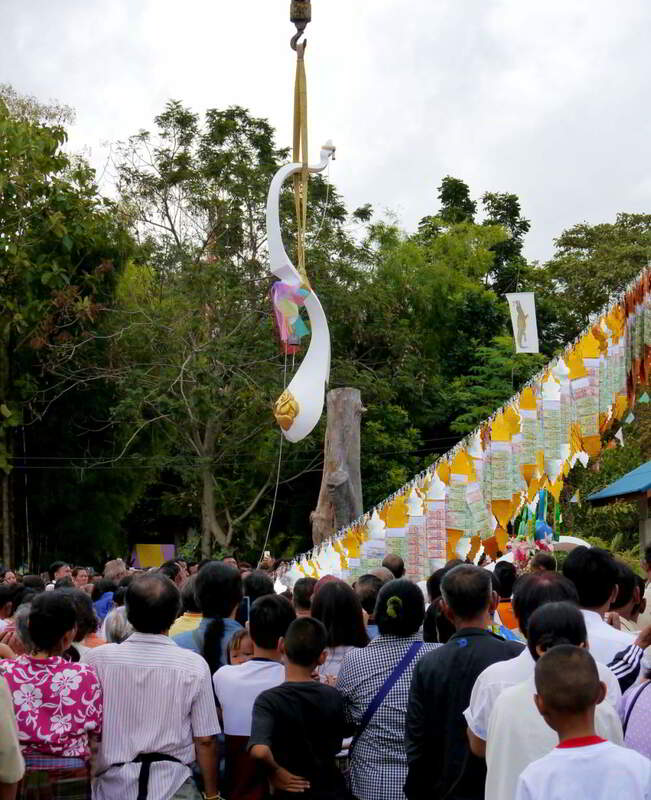 This particular ‘Raising of the Chofah’ coincided with the Kathin festival at a temple in Buriram. One thing has become apparent to me from my visits to Buriram, village life seems to be more orientated around the local temples. There is a “temple culture” which is probably not so visible in the cities. Once raised, the Chofah is fastened in position on the gable of the temple roof.